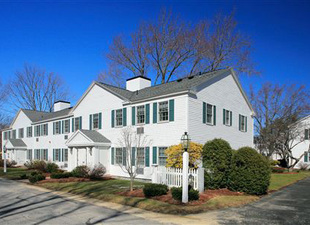 LEXINGTON, MA—It is hardly a revolutionary move, but the Hamilton Co. has added to its expanding multifamily portfolio by acquiring the Battlegreen Apartments, a six-building, 48-unit complex purchased from Boston Residential Group for $10.0 million. The 4.1-acre property at 32-42 Worthen Rd. is close to another Lexington apartment development on April Lane owned by Allston-based Hamilton Co.
“It’s an excellent property in an excellent community,” Hamilton Co. President Carl A. Valeri tells The Real Reporter, so well-regarded that his firm agreed to buy Battlegreen minus any contingencies, even eschewing a standard due diligence review. Negotiated by Cushman & Wakefield’s multifamily sales team, the asset traded at a capitalization rate in the 5.0 percent range and closed within 10 days of being put under agreement. C&W Executive Director Simon J. Butler concurs that Hamilton was “aggressive in its terms,” although he declined to discuss specifics such as pricing. Butler also would not identify other suitors, but concurred it drew substantial interest and says he believes BRG “was very satisfied by the outcome.” Joining Butler in marketing the asset was C&W Executive Director Biria St. John, Michael Byrne and John McLaughlin. The prolific multifamily sales division is part of C&W’s Capital Markets Group led by Robert E. Griffin Jr.
A proven location and a plethora of nearby retail amenities was among the factors sparking interest in Battlegreen Apartments, conveys Butler. Developed by BRG in 1965, the complex benefits from his client’s stewardship of the property, and having a Lexington address, he says. There is a lot to like about Lexington from a demographic standpoint, agrees Valeri, and Battlegreen Apartments has traditionally fared well, evidenced by a 100 percent occupancy at the time of sale and rents that command monthly rents of $1,600 for a one-bedroom unit and $1,950 for the two bedroom offerings. Further upside is expected, adds Valeri, whose firm is among Greater Boston’s largest owners of multifamily product. The Lexington acquisition continues to increase the firm’s standing, with Hamilton Co. also recently outpacing similarly heated competition to acquire a 316-unit, multi-building portfolio concentrated in neighboring Arlington last December, paying $41.2 million for that package. The company drew national attention in 2009 when it pair $129.5 million to secure the Dexter Park Apartments in Brookline, a 409-unit asset that also drew bidders from across the country. Bought on the back end of a 1031 exchange following last month’s sale of 66 units in Malden, the Lexington purchase went smoothly, says Valeri, crediting BRG leadership for a cooperative approach. “It was an easy transaction, and I credit (BRG) for that,” he says. “They were great to work with.” C&W’s team also helped in completing the swift conclusion, according to Valeri, whose firm is quite familiar with that contingent. C&W was also broker for the Arlington and Dexter Park listings, as well as Hamilton’s April Lane property, the Minuteman Ridge apartments situated off Worthen Road.